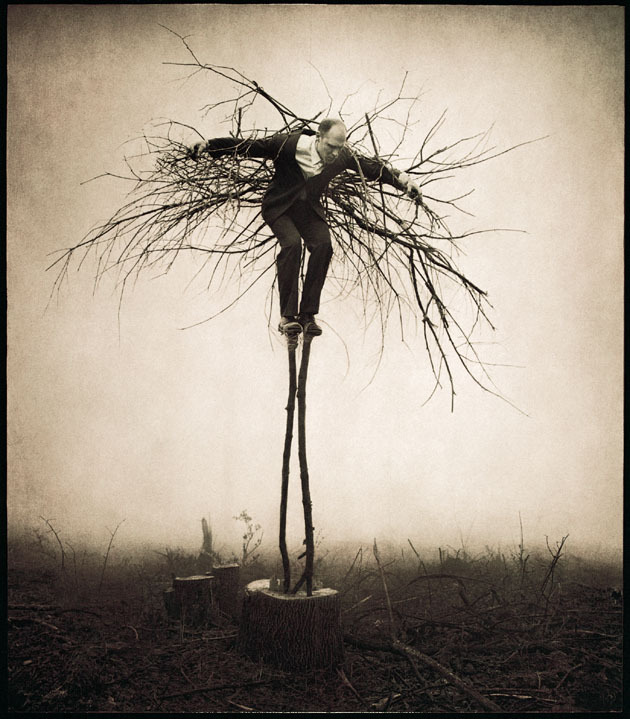 I wrote here last year about my admiration for the photography of Robert and Shana ParkeHarrison contained in their beautiful book, The Architect’s Brother. They are spectacular and moody allegorical images that really captivate the imagination. What I particularly liked is that they are true photographs– no computer manipulation. Everything you see is really in their viewfinder. They create their visions as an old film producer might have, with elaborate sets consisting of detailed painted backdrops and theatrical props. I think that staying away from computer generated effects gives their work a fuller sense of reality and possibility. Maybe it’s that sense of rightness I often mention on this blog. Whatever the case, it’s powerful work. Here’s a neat video I came across that features a very wide cross-section of the ParkeHarrisons’ work, including works in full color rather than the sepia tones that mark that work in The Architect’s Brother. These striking images are set to music from Canadian indie band, The Bresnard Lakes. Strange, beautiful and compelling. At 1:35, did you see your red chair falling from the sky?